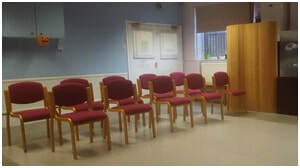 We have a number of excellent rooms for organisations to hire in a very convenient location. There is a waiting area with free tea and coffee, the Longfield car park opposite is also free, we are situated right next to Prestwich Tram stop. Building accessibility: our ground floor (4 large rooms and 2 therapy rooms) is fully accessible with disabled access toilets. 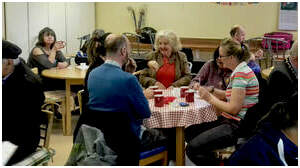 You can call us on 0161 696 7501 or email admin@creativelivingcentre.org.uk for more details. We have a large room available which can hold a seat up to 45 cinema style seating & is great for other activities including Yoga, Singing, dance and talks. 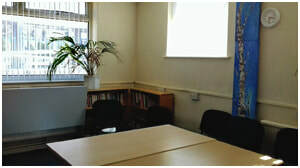 The sunflower room is perfect if you require a space to host a small/medium sized meeting or Interview. Seats up to 10 comfortably. We have a lovely Café space for meetings gatherings with seating up to 30 featuring a clean, modern kitchen with a 5 star hygiene rating. 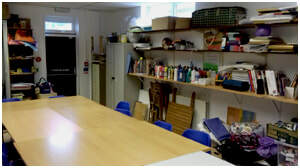 A dedicated arts and crafts room is available to hire for groups of up to 16. Flexible layout with a number of seating and table options. 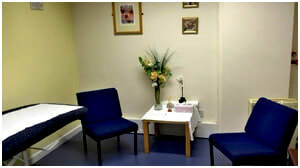 We offer four therapy rooms perfectly set up for massage therapy and talking therapies. Suitable for up to 4. We have information on seating options above, however if you would like more information please don't hesitate to contact us. How accessible is your building?